The Campus Martius website maintains a list of links to local historical sites, historical resources, and trip planning helps. Marietta and its neighboring communities have a lot to offer. There’s enough history in our region to keep you busy for a lifetime! The Anchorage – 1859 Italianate Villa open by appointment for tour. 22 rooms including tower. Volunteer restoration managed by the Washington County Historical Society. Putnam Avenue (Harmar Village), Marietta. The Castle – 1856 Gothic Revival home. Open year round for tours. Check their website for current events. The Castle offers workshops, musical concerts, teas, story-times, and many seasonal events. 418 Fourth St., Marietta. The Henry Fearing House – 1847 Victorian home open for weekend tours from May to October. Restored and managed by the Washington County Historical Society. 131 Gilman Ave., Marietta. The Toy and Doll Museum – Collection of antique toys and dolls housed in a restored Queen Anne – Eastlake home. Open May to October on weekends. Additional tours available by appointment. 206 Gilman Ave., Marietta. Indian Mounds – Read about Marietta’s Native American Earthworks. Remaining today are earthworks at Sacra Via, the public library, and Mound Cemetery. Visiting Marietta’s mounds makes for a nice walking tour, plus you’ll enjoy great Victorian architecture along the way. Underground Railroad – Local Historian, Henry Burke, documents the rich history of the Underground Railroad in Marietta and the surrounding region. 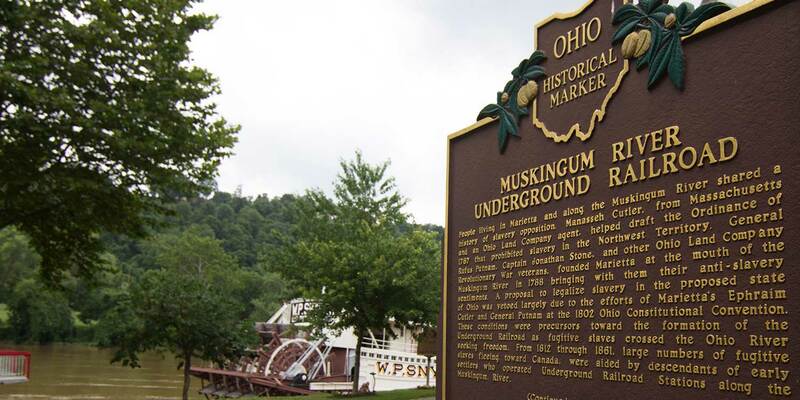 Marietta has several Underground Railroad stops and routes throughout the area. Number to order the book The Pioneers, please. I tried the one listed 317-373-3750 and got a fax. It screeched, no ringing tone. Thank you. The correct number is 740.373.3750. I tried the number listed 740-373-3750 and got a, I think, Fax. Please clarify. Thank you. Sometimes when both lines are busy it seems to kick the call over to the fax line for some reason.☹️don’t know why. OMG two of my favorite things together! Read the latest blog by Dave Baker! Ephraim and older brother Rufus were certainly brave and tough soldiers, and noble gentlemen. Thanks for posting! Come in and see us tomorrow, Friday, April 5th for BROWN BAGGIN’ THRU HISTORY! We will even have these great books for sale in our gift shop! Topic: The Damsels to the Rescue"
Judi Tarowsky will be telling two stories, "The Nettle Spinner" and "The Groach of Loc," both from the Andrew Lang Fairy Books. "The Nettle Spinner" is a tale from Belgium, and "The Groach of Loc" is from Brittany, one of the Celtic Nations. In many of these old Fairy Tales, women are the heroes - they face the challenges put before them and manage to solve the problems and bring things to a just resolution. We often think of old fairy tales as ones in which the damsel is in distress and much be rescued - but not in these cases! The two female heroes in these stories go about facing their challenges in two different ways, but in the end, come out as victors for all. Here is the first sentence of "The Pioneers." I'm waiting anxiously to read the new book about my ancestors in Marietta.